Next in the series of webinars to be offered by the Board for Certification of Genealogists is Monday’s webinar — “‘Of Sound Mind and Body’: Using Probate Records in Your Research” — presented by Michael Hait CG. Created as part of the BCG Skillbuilding Track at the 2014 National Genealogical Society conference, Michael’s lecture discusses the process associated with the administration of testate and intestate estates and the records created as a result. The webinar is open to all genealogists who want to improve their skills, and begins at 8 p.m. Eastern (7 p.m. Central, 6 p.m. Mountain, 5 p.m. Pacific). To register and receive your unique link to the webinar, please go to https://attendee.gotowebinar.com/register/5876550263529763585. 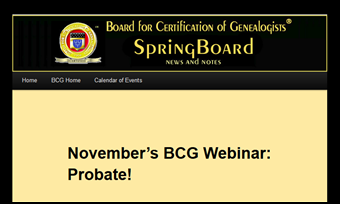 To read more about BCG and the webinar series, check out SpringBoard, the blog of the Board for Certification of Genealogists. That’s where announcements of future webinars will be made, and where information will be posted when and if recordings of the BCG webinars become available later. Hope you can join Michael and BCG on Monday!! WOW–Just registered. Thank you so much Judy! Look forward to your lecture and seeing you on the 18th at the (MVGS) Mount Vernon Genealogical Society Meeting. I just registered, too…love using probate records! Terrific! You should enjoy this! So glad it’s available for everyone too. And we are working on making recordings of these webinars available online after the fact. Keep watching the BCG blog for more info.